Spiritual warfare often sneaks up on us when we least expect it. Two weeks ago, I shared about my personal weight issues here on the blog because the Lord just wouldn’t leave me alone about it. I was afraid to open up that part of myself, but I trust that He knows best. The response has been overwhelmingly positive and even resulted in a speaking engagement for me. Needless to say, I was elated! It felt like a major spiritual victory to walk in obedience and see such immediate fruit. Of course, as soon as I began to rejoice in the work the Lord was doing (in spite of me! ), the murmuring voice began. You’re not a speaker. Who are you to think you have something to say? You just ate donuts last night, and here all these people are praising you for keeping up the good fight. You’re a fraud. I felt the arrows of the Enemy, and I even let a few of them pierce me before I remembered who that voice belonged to. Even once I recognized the slippery snake, I struggled to ignore his murmurs. And the more I resisted, the louder he became. I found myself in the midst of an unexpected spiritual battle and I felt unprepared. I had not put on the full armor of God that morning, so my belt of truth was quickly slipping as the arrows came in quick succession. I cried out for mercy! Our Father was quick to answer with truth from His word. He reminded me of my pre-approved status. He reminded me that I am a work-in-progress, not yet complete, but fully loved, fully accepted. My friends, when you experience a victory in some area of your life, don’t be surprised to find the Enemy lurking just around the corner. He loves to set a trap for us when we are the most joyful, the most productive, the most faithful, the most determined. He delights in seeing us fall from the greatest heights to the lowest depths. We must be prepared for spiritual warfare, my sisters, for the battle is coming. The Word aptly describes Satan as a prowling lion seeking for someone to devour. One way to be prepared is to put on the full armor of God, specifically the sword of the Spirit. 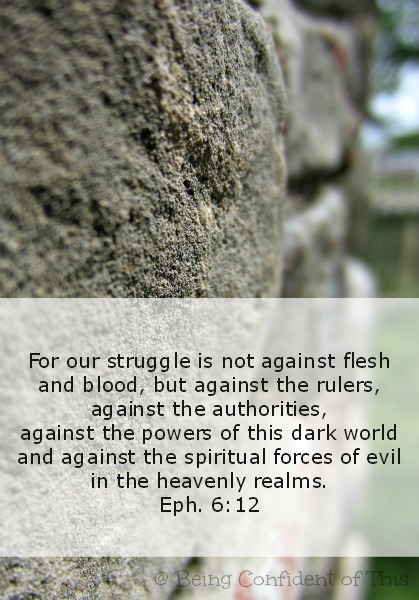 Use these spiritual warfare verses to reign in the attack of the evil one! 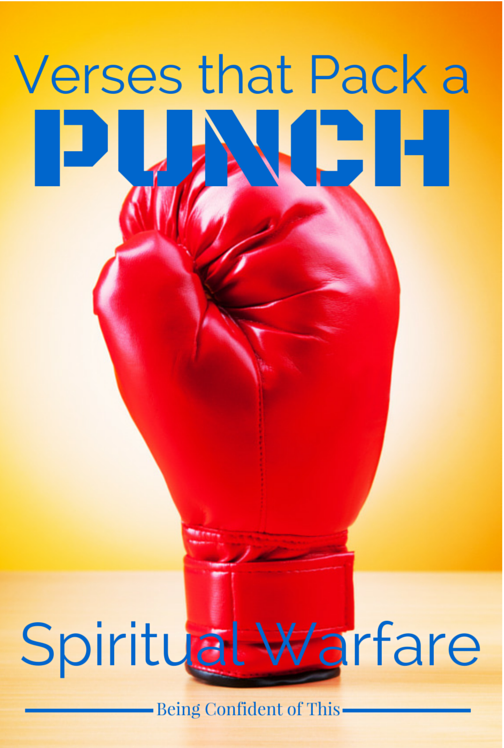 Spiritual warfare verses that pack a punch! 22 For in my inner being I delight in God’s law; 23 but I see another law at work in me, waging war against the law of my mind and making me a prisoner of the law of sin at work within me.24 What a wretched man I am! Who will rescue me from this body that is subject to death?25 Thanks be to God, who delivers me through Jesus Christ our Lord! For when I am weak, then I am strong, even when you don’t feel it. For when I am weak, then I am strong; keep saying it until you believe it. 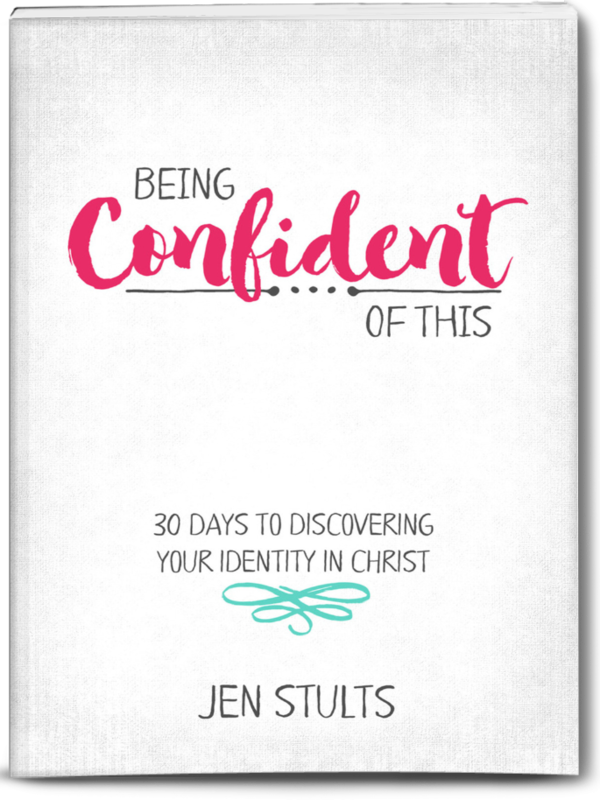 For more scripture that packs a punch, visit the link-up below! Wow, congratulations on the speaking engagement! God is good when we are brave to be obedient. I love the verses and passages you’ve shared here – I was considering adding the verse from Zephaniah in my post; it’s one of my favorites! Thank you for sharing these – I’ll definitely be back to look through them again as the week ahead promises to be ripe for doing battle – long days, short tempers, new schedules…! 😉 Our God is so good!! Thanks, Becky! It’s just for a local group, so nothing big really, but it was a big deal to me. 🙂 I’m really glad for our topic this week because I needed some reminding of these truths. Praying peace for your week! Jen, how right you are! Satan cannot stand when we walk in victory. He will do everything he can to discourage us. I know you are going to be such a blessing to those you speak to. Romans 8:38-39 is one of my favorite passages. There is so much truth and encouragement and love in those two verses. If only we, the body of Christ, could really understand how very much we are loved, how very secure we truly are, we would walk so differently in this world, I believe. Thanks for a wonderful post! I just love Romans 8, Leah! It’s the victory chapter! I completely agree – what power there is in remembering who we are in Him. Thanks for stopping by! This is so true! That is so like our Enemy, to try to take any victory. He is nothing but a thief! Great job resisting him and retaliating 🙂 Saving your post because of the awesome topical verses 🙂 Have a great week! Yes, a thief is he! I’m happy you found the verses helpful, Cate. Thanks for stopping by here! Love, Love, Love God’s faithfulness and your perseverance in the fight! Even when we eat donuts the night before—>>> His mercy!!! —>>> It’s new every morning and His grace is sufficient, and HIs power is made perfect in our weakness. Love for Jesus and boasting of His mercy, we are all qualified for that! Praying for you as you press on and bless the women with your encouragement!!! Haha, I really did eat little donuts the night before AND the night after. I’m so thankful each day is a fresh start, a fresh chance to walk in obedience. Such sweet words, Chris. I thank you for blessing me with encouragement today! 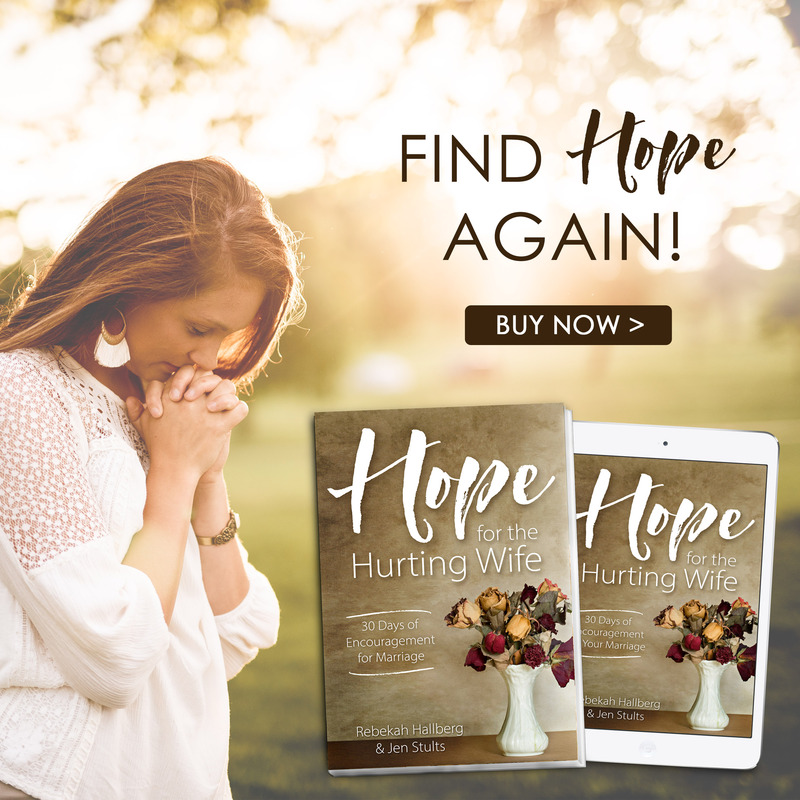 Oh, Jen, I so often find myself in this position too: “I cried out for mercy!” I’ve been fighting a spirit of tiredness of *other* people’s problems lately and I have to cry often for mercy–not only for myself but so I’ll give it to others. I appreciate your honesty here; it helps us all. Thank you for sharing these verses. I’m reading every one…. For when I am weak, then I am strong! Lisa, somehow I missed out on your comment! Sorry about that. I’m so happy to hear that this spoke to you. I’m in a awe of a God who knows just what we need and when we need it! Thanks for leaving some encouragement here. Jen, I just stopped in because of your comment on my site, and have to tell you how much I loved this post! I am speaking at a ladies retreat next weekend, and one of my topics is “When You Feel Like a Failure”. You gave me some new food for thought as I prepare! Thanks for the reminder that when we “fail” we need to remember that we are in a spiritual battle, and need God’s Word and armour to help us in that battle. Thanks, Kathie! I’m so glad it spoke to you. I hope your ladies retreat was fruitful! Thank you for sharing about your battle, and sharing about how you fight it with the sword of the Spirit–the Word of God. Blessings to you! Thank you for stopping by and leaving some encouragement here. Short and sweet is good! I just had a hard time choosing only ONE verse from Romans 8 – so much awesomeness there. 🙂 I greatly appreciate your prayers! When we say yes to God, He meets us. Thank you for sharing these powerful verses. I just my have to write a post and link up. Please do! 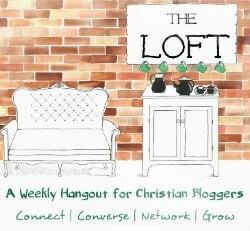 🙂 Although I think this is last week’s link-up – this week we are doing a “potluck” style, so you can still include it in the current link-up if you wish. It’s live already. Always good to see you here, Barbie! Happy to hear it, Andi! Thank you so much for sharing these. I am seriously going to print out the Scripture portion of this post to keep in my Bible. I have been trying to get my house in order and it always seems like when I start to feel as though I am getting ahead or getting a handle on things satan always starts in with a vengeance. Hmm, Robbi, you gave me a good idea to make up a printable to go with this – thanks! 🙂 I love the idea of keeping them near you. Keep that enemy at bay! You’re welcome! Thanks for sharing it around, Kelsey. I, too, pray others will be encouraged. Thank you for putting all these verses in one spot and grouping them this way! I will have to participate in your link party sometime. I think that’s a great idea. You are so welcome, Katy! 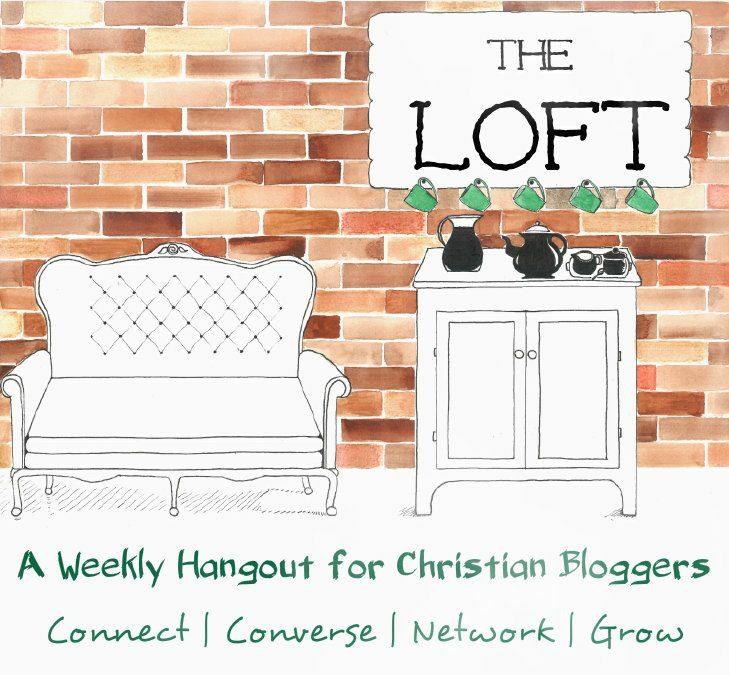 We’d love to have you link up your recent Christian Living post, too. If you have questions, message me via facebook or email and I’ll be glad to assist. These are great verses! 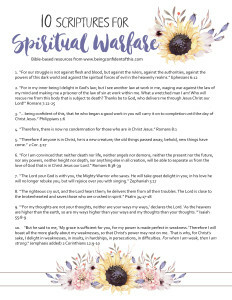 I’ll definitely be making a note of some of these for when I experience spiritual warfare in my life. Thanks for sharing! This is my favorite of the ones you shared! I love it! There’s so much encouragement in this cerae! I’m adding it to my prayer wall. Yes and amen! This reminds me of the book “Fervent” because she points out how powerful praying the Word of God is. Congratulations on your speaking engagement and I know you will own it! Thank you for being real and for the encouraging scriptures! Love these verses and this reminder, Jen! I read Fervent earlier this year and I seek to keep this in the forefront of my mind – that we really are in a battle. Thanks for helping us armor up!